The year’s best meteor shower, the Perseids, is happening now with the peak predicted to occur on the night of August 11-12. With the Moon out of the sky after 1 a.m. EDT, which is one peak prediction time, an observer with a good (read dark and unobscured) location could see 60-100 meteors - falling stars - an hour. 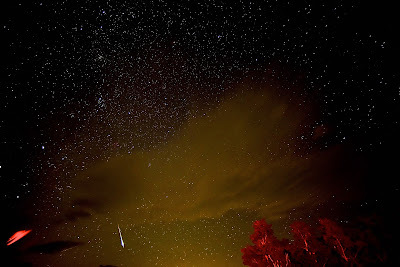 Last year over 1100 people went to Shenandoah National Park http://wtop.com/the-space-place-tech/2015/08/perseids-coming-shenandoah-national-park/ to see the Perseids with 800 of them going to Big Meadows and they weren’t disappointed . Each year at this time our planet encounters a debris stream of cometary dust made by Comet Swift-Tuttle http://www.space.com/33677-comet-swift-tuttle-perseid-meteor-shower-source.html?cmpid=514648 . As Earth moves in its orbit around the Sun it collides with this debris stream and the cometary debris particles hit our atmosphere to become “shooting or falling stars”. Traveling at 37 miles per second (133,000 miles per hour) these cometary bits hit the atmosphere 80 miles up and heat the atmosphere white hot which is what we see. Usually the size of a “Grape Nuts Cereal” nugget they can also be as big as a pebble or a little larger. Speed plus size makes for a lot of “oohhs and aahhhs” while we watch the Perseids through the night. Research by NASA has determined that of the dozen or so annual meteor showers the Perseids produce the largest number of fireballs or meteors that are as bright or brighter than the planet Venus. The gravitational interaction of Jupiter with the debris stream in 2014 will bring the stream closer to Earth this year which may cause the predicted higher number of meteors per hour than usual http://www.skyandtelescope.com/press-releases/2016-perseid-meteors/ .Such Perseid outbursts have been observed before. You do not need any equipment or know how to enjoy the show - just find a place where you can put a lounge chair or blanket to see the sky. 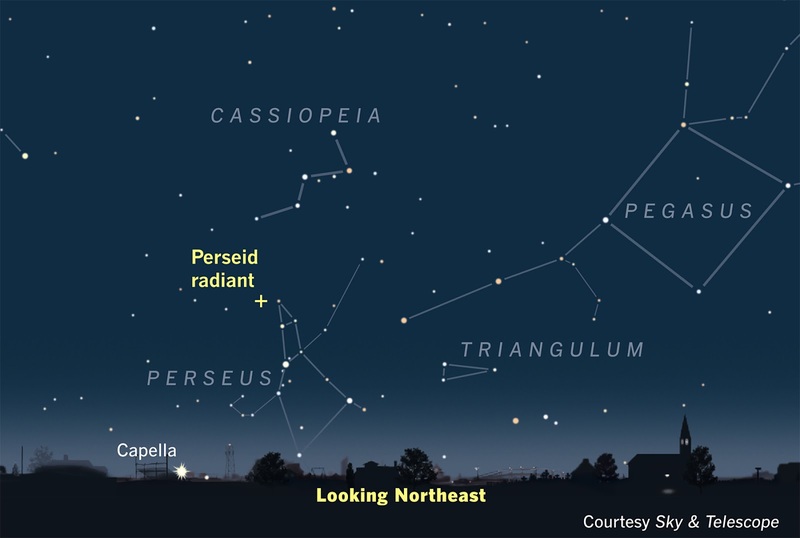 Starting at 11 p.m. in the northeast the constellation for which this meteor shower is named - Perseus - hangs low above the horizon and will rise higher as the night progresses. A meteor that is part of the shower can be traced back to Perseus. 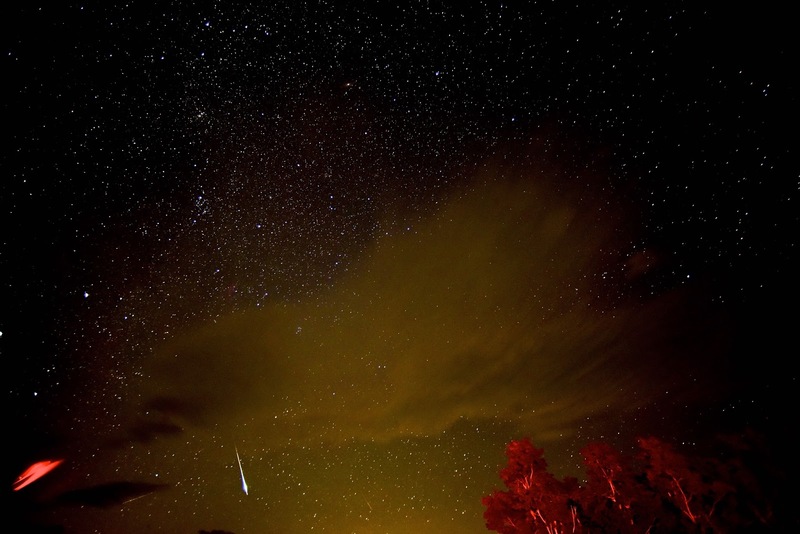 Sporadic meteors that are not part of the shower can be seen during the night as well. The shower should improve after the Moon sets and Perseids can appear anywhere in the sky but looking straight up gives you the widest viewing area - this is where the lounge chair or blanket come in handy. If you are a city dweller you still may see the brightest Perseids as long as you are not staring into a street light or nestled in amongst tall buildings. The view of the Perseids is worth it from the suburbs as long as lights and obstructions are minimized as best you can. 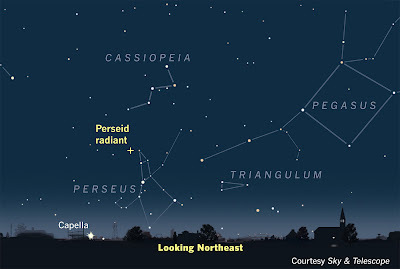 If it is cloudy you can still observe the Perseid Meteor Shower by a very novel and cool means. As I write this I am listening to meteor radar - yes radar that scans for incoming meteors as well as satellites and space debris. It is a fascinating way - just heard one!! - to monitor a meteor shower like the Perseids. Essentially the louder a ping is, the brighter the meteor would be in the sky. You can listen during the day and night, so tune your browser to http://spaceweatherradio.com to listen in just like you would go out to watch. You can also tune in to NASA via a live broadcast of the Perseid meteor shower that will be available via Ustream overnight on Aug. 11-12 and Aug. 12-13, beginning at 10 p.m. EDT. Enjoy the shower with family, friends or your significant other. Some food and beverages are an added plus. Be sure to have extra clothing as it can get cool at night. Hope your skies are clear!